Since Larry Summers's talk at the IMF in November, there has been some blog discussion of "secular stagnation." The secular stagnation idea seems to have originated with Alvin Hansen (AER, 1939), but I assure you that reading that will not enlighten you as to why we may or may not have entered a period of secular stagnation. I have been as puzzled as anyone about secular stagnation and what it might mean, and I'm not sure that Paul Krugman's latest post on the topic helps much. There are three dimensions of aggregate economic data that Krugman wants us to think about, and he argues that these reflect aspects of secular stagnation. The first is the decline in the real rate of return on short-term government debt that has occurred since 1980. On this, I think it helps to broaden our perspective a bit, and look at a longer time series. The next chart shows the 3-month T-bill rate, minus the pce inflation rate (year over year) for the period 1948-2014. If we take this as a measure of the real interest rate, we can see the decline in the real rate from 1980 to the present, which Krugman wants to draw our attention to. But, given the fact that the average real rate over the sample we're looking at is 1.13% (as shown in the chart) the 1980-2000 period is not the best benchmark we could choose, as the real rate was well above the sample average for most of that period. The real rate has certainly been low - on average - since 2000, but it was also low in the 1950s and the 1970s. So, in terms of this measure of the real rate, the low real rates we have been observing are not unprecedented, and there appears to be no particular reason for us to extrapolate low real rates into the future for a long period of time. Indeed, there are good reasons to think that the real rate should continue to increase. This is important, as it seems to be a key part of the Summers/Krugman narrative on secular stagnation. Summers and Krugman think that there is something that will keep the real rate low for an extended period of time and that - in Old Keynesian or New Keynesian fashion - this requires an extended period of time during which the central bank's nominal policy interest rate should be at the zero lower bound. The other two aspects of the data that Krugman wants to focus on are the drop in household debt since the last recession, and the drop in the growth rate of the population aged 20-64. Through back-of-the-envelope calculations, Krugman translates what he sees in the data into a drop in the demand for consumption and investment of 7% of GDP, which I'm assuming he thinks will persist indefinitely. Of course, if we look at these observations through the lens of conventional long-run economics, the view for the future is anything but gloomy. Krugman is thinking that the increase in the savings rate as the result of low household debt, and the drop in the working-age population growth rate are bad news. But the Solow growth model - which forms the basis for modern growth theory, and which we teach to undergraduates (see Chapter 7 of this fine intermediate macro book) - tells us that an increase in the savings rate and a decline in the population growth rate will lead to a short run increase in the growth rate of per capita real income and a long run level increase in per capita real income. That seems like a good thing. So Krugman must have some kind of unconventional long-run economics in mind. But what is it? I've been meaning to read "A Model of Secular Stagnation," by Gauti Eggertsson and Neil Mehrotra (E/M), which Gauti posted last month, but other things got in the way. E/M seems to have Krugman's blessing, and Simon Wren-Lewis provides some explanation, for those who might not be familiar with what E/M are doing. As far as I know E/M is the only attempt at making rigorous economic sense of what Summers and Krugman have been talking about. So what is in the paper? E/M construct a 3-period-lived overlapping generations (OG) model to address the problem. Stripping their model down to essentials, suppose the population at each date consists of the young, the middle-aged, and the old, and that the total population grows at rate g. To start with, this is an endowment economy in which the young and old are endowed with nothing, and each middle-aged person has an endowment of y units of a perishable consumption good. Each person wants to consume in all periods of life, has time-separable utility, and discount factor B. Assuming that there are no assets in this economy - no money, no government bonds, no capital - the only exchange in this model is in a credit market in which the young are borrowers and the middle-aged are lenders. The young borrow, pay back their loans in middle-age, and use the returns on their loans to the young to consume in old age. E/M add to this a borrowing constraint. There is an exogenous quantity d, which is the maximum amount that a borrower can commit to repay in the next period. Then they follow Woodford in treating this as a "cashless economy" in which zero money balances are held at all dates, and there are prices of goods in terms of money that support that equilibrium. Then, in a fashion familiar to everyone who has seen short-run New Keynesian models, wage/price rigidity is imposed - here in the form of permanent wage rididity - and then the model behaves much like in Eggertsson and Krugman's paper, except in a long run context. There are paradoxes of thrift, toil, and flexibility, more government spending is a good thing, etc. For what I want to do, a 3-period OG model is not the best vehicle, as it has "startup" problems. Once we introduce other assets, it won't have nicely behaved equilibria. The following model will give us almost exactly the same thing as the E/M model does, but it's more tractable. Suppose an initial group of old people (who will come in handy later) who live only one period, with everyone else being two-period-lived. At each date there is a group of young and a group of old, and the total population grows at rate g. There is heterogeneity in each generation. A fraction a of economic agents are lenders who receive y units of the consumption good when young and 0 when old, and a fraction 1-a of borrowers who receive 0 when young and y when old. We'll assume log utility and discount factor B, as in E/M. So, the real interest rate is determined by the discount factor and the ratio of borrowers to lenders. We can have a very low real rate if there are many lenders and few borrowers. So, in this case, the real interest rate is lower the lower is d, i.e. the tighter is the borrowing constraint. This is of course standard behavior in models with borrowing constraints - e.g. incomplete markets models. where i is the inflation rate. So if r is very low, then i must be very high so that the real rate of return on money does not exceed the real rate of interest. So, now we have a problem. Woodford constructed his cashless economies so as to focus his attention on a sticky price friction. In doing so he was implicitly (or sometimes explicitly) stating that other types of monetary frictions do not matter much, or were safely ignored for the problems he was interested in. To show that a cashless economy made sense technically, Woodford constructed simple examples where this works, for example with money in the utility function (and separability) or by taking the "cashless limit" in an economy where money is used in transactions. It's not clear how this works in the context of this OG model, as of course these models were constructed and used, for example by Samuelson and Peter Diamond, as models in which outside assets (money and government debt) could matter. Indeed, there are two potential inefficiencies that exist in this model (depending in part on how we define inefficiency). One is due to the borrowing constraint - a standard credit friction. The other is a standard dynamic inefficiency. And both of those frictions are things that we often use, in various contexts, to motivate a role for government and central bank liabilities. Following up on that thought, suppose that we introduce a fixed stock of money, M, which is the collective endowment of the first period old. Then, we can construct equilibria in which this money is valued. But, the "cashless" equilibria we already worked out (equations 1 and 2) are also equilibria - what we call the "nonmonetary equilibria," for which money is not accepted in exchange because it is not accepted in exchange, and it thus has zero value. But what we are interested in are monetary equilibria, and we will restrict attention to stationary ones - equilibria where consumption allocations are constant across generations. Then, either the monetary equilibrium exists, and it's Pareto optimal, or (4) does not hold, in which case the nonmonetary equilibrium is Pareto optimal. So, without the borrowing constraint, a fixed stock of money solves the dynamic inefficiency problem. What's going on here? E/M write down a model with two inefficiencies: a dynamic inefficiency, and a credit friction. With sufficient flexibility in taxation, the government can solve both inefficiency problems with the appropriate provision of government liabilities. Why all the fuss with wage rigidity and zero-lower-bound "paradoxes" is not clear. I can see what E/M and Summers/Krugman might be getting at though. The fact that real rates of return have been low since the financial crisis may be important, and could make a big difference for how monetary policy should proceed going forward. What elements would we want in such a model so that it can enlighten us about what is going on? It seems we would like to explain at a fundamental level why the real interest rate is low. This may reflect particular credit frictions, but we want to be explicit about what they are. Also, we would like to see a sufficient array of assets in this model. Perhaps some of these assets are used as collateral, which appears to have been important during and after the financial crisis. We also want to include the assets and liabilities that appear on both sides of the central bank's balance sheet. Otherwise, how can we analyze monetary policy in a sensible way? We also want the model to say something about liquidity traps in a low-real-interest-rate world. I've got just the thing. The elements of the desired model I've sketched are right up the New Monetarist alley. We think of our research program originating, in part, with the work that Neil Wallace and his Minnesota students and coauthors did in the late 1970s and 1980s. Those people worked with various OG models - like the one that E/M study, and the one I was playing around with above. Of course we long ago moved on to other things. There's much current monetary research that uses versions of the Lagos-Wright model. I like this framework, not because it tells us much of anything new about monetary exchange, but because it admits a whole array of interesting financial and credit market behavior in a highly-tractable way. You can do much more with it than with an OG model. So, here's an example. I didn't know until I read E/M that I had constructed a secular stagnation model, but according to them, that's exactly what my quantitative easing paper is. In that model there are banks, there's monetary policy, there's a collateral constraint (endogenous! 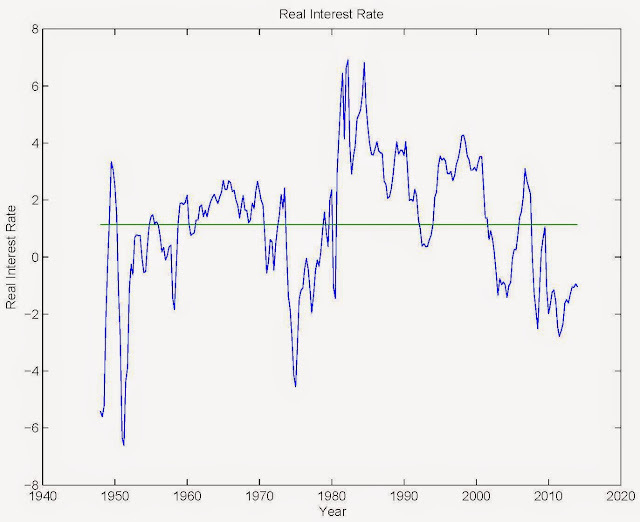 ), and you can have a negative real interest rate at the zero lower bound with positive inflation. There can be secular stagnation, in that the low real rate can persist forever, due to a shortage of collateral, and that collateral shortage is reflected in low output and inefficient exchange. The collateral shortage persists because of stupid fiscal policy, and the shortage can be mitigated with QE by the central bank. Cool, right? I think Krugman actually loves the thing, but can't bear to say it. You may have heard this story. I got it from John Kennan, who claims it originated with computer scientists. There are some monkeys in a cage. Someone puts a banana at the other end of the cage. When one monkey goes for the banana, the other monkeys are sprayed with a fire hose. This is repeated a few times. Then, whenever one monkey makes a move for the banana, the other monkeys beat him/her up. After a while, one monkey is replaced. Of course, that monkey goes for the banana and the others beat him/her up. This keeps happening, and eventually none of the monkeys in the cage have ever seen a fire hose. But whenever a new monkey arrives and makes an attempt to get the banana, he/she gets beaten up. Asked why, the monkeys say: "That's the way we've always done it."